I love Augusta National and the Masters. Augusta National is home to many of the greatest holes in golf. I have never seen a better property for a world-class golf course. The rolling hills are perfect for golf, and the routing of the course is remarkable. Bobby Jones and Cliff Roberts commissioned the great Alister MacKenzie to design Augusta National in 1931. MacKenzie was coming off his masterful Northern California designs of Cypress Point and Pasatiempo. MacKenzie had established himself as the greatest golf course architect in the world. He was known for his artistic flair and creating courses that challenged the world’s best but remained playable for the average joe. Upon its opening in 1933, Augusta National was the greatest course in the world. Today, Augusta is no doubt among the world’s greatest courses. Sadly, in the 2000’s, membership drove changes. Most notably, tree planting has cost Augusta National some of its spirit, a spirit that produced the greatest championships in golf and led a country to fall in love. The wide fairways of Augusta National gave every style of golfer a chance at succeeding by finding the route to the hole that best fit their skills. 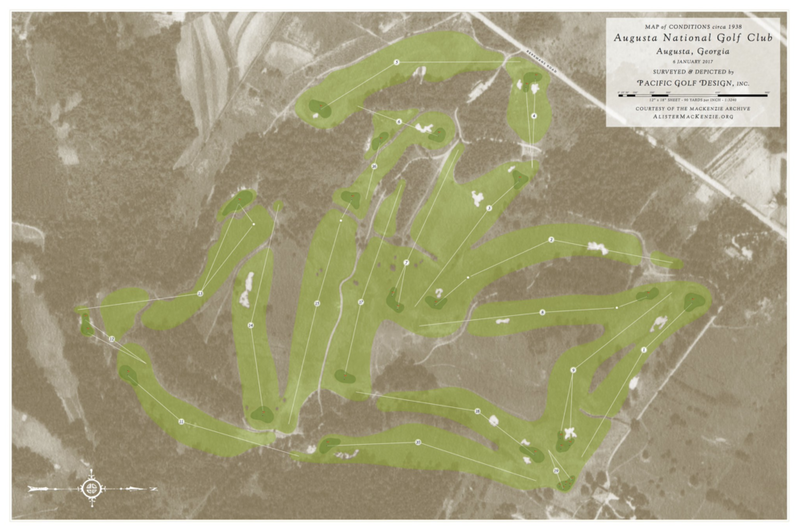 Today, due to the tree plantings that narrowed many of the fairways, that is no longer the case at Augusta National. In an effort to control scoring, the world’s greatest golf course has slowly been strangled. The distance explosion forced Augusta National to tinker with the course. The changes have included lengthening the course, introducing a cut of rough and narrowing corridors by planting trees. Some of these changes were necessary to protect shot values (lengthening). Others (tree planting) have changed the golf course’s ethos. Augusta is no longer a strategic masterpiece that rewards the courageous and great shot closer. Today, the course is an arduous test of survival akin to a U.S. Open course. Candidly, the lengthening of holes at Augusta National has worked. It has restored the shot values of many of its iconic holes. But the real tragedy is the narrowing of Augusta. The tree plantings and a cut of rough have made the course less interesting and less thought-provoking. Any course - even Augusta National - can be made more difficult by adding trees. They prohibit players’ ability to set up angles to attack the course. When you narrow the course, you get mindless, robotic golf. The course tells the player where to hit it and everyone plays their next shot from the same angle. Lost is the creativity and strategy. One of the holes that has seen the most narrowing is the long par-4 11th. Saturday's third round saw none of the 51 competitors make a birdie on a day with little wind and soft greens. A look further into the 11th, and scoring over the last 35 years illuminates how tree planting has choked the strategy of the golf course and taken away some of the excitement of the course. The 11th has undergone a flurry of changes since Tiger Woods won the Masters. Some of the changes have been good. But others have stripped away from the hole's original strategy and intent. Here's a graph that details the scoring differential over the years. As you can see, in the mid-90's, scoring hit an all-time low on the 11th. Metal driver heads and increased distance had taken some of the teeth from the design. To combat this in 1999, Augusta National introduced rough and changed the positioning of the 11th tee box, moving it to the right to force a cut shot to gain the advantageous right side of the fairway. The scoring average immediately jumped back to historic norms for the hole. The changes didn’t affect the hole’s strategy. The right side of the fairway was still available to players, which yielded the best angle to attack certain pins. The next major change came in 2002 when Tom Fazio lengthened the hole making it a whopping 490 yards while retaining the fairway width. If Fazio’s sole goal was to make the hole harder in the wake of better equipment and the golf ball, he succeeded. Once again, the scoring returned to traditional norms and the hole’s strategy remained intact. Before 2002, the alterations to the 11th had not dramatically altered MacKenzie and Jones’ original design to the hole. The options of playing right or left based on a day's given pin still remained until 2004. Hootie Johnson commissioned a major tree planting up the right side of the hole, the new trees choking the corridor from 90 yards to 45 yards wide. In one fell swoop, the character of the hole changed. It was no longer a strategic hole that allowed for birdies, bogeys and worse. Following 2004's narrowing, the impact on scoring has been evident. The 11th is harder than ever. It’s difficult because the strategy was compromised. Players are forced to approach every pin on the difficult green from the exact same place. The 11th took on one more lengthening in 2011 to stretch the hole back over 500 yards. Today, some players don’t even try to hit the green on their second shot. Fearing a bad bounce from the mounds around the green and poor angle, they choose to hit it short right and chip up. The poor angle from the fairway has taken away the drama of the hole. 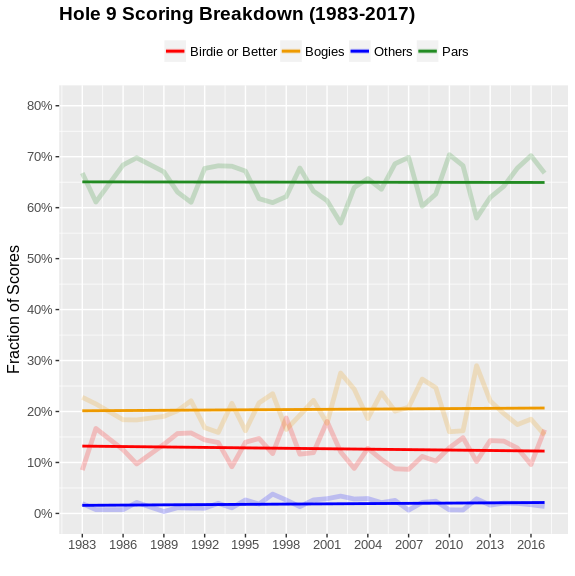 The scoring trends over the years tell the story of the hole. In the mid 80's and early 90's, birdie or better would be had by about 10% of competitors. Today, birdie or better is achieved by less than 5%. In the mid 80's and early 90's, a double bogey and worse occured about 4% of the time. Today, it's up to about 6%. The tree planting efforts on the 11th have effectively traded birdies for bogeys and doubles. In contrast, the 10th hole at Augusta National has seen far fewer changes over the years. The most notable change came from Perry Maxwell in 1937 when he moved the green back to its current location. From that point forward, it’s remained mostly intact. In 2001, Tom Fazio added 10 yards of distance, and the first cut of rough was introduced. The fairway narrowed, but the playing corridor stayed wide. Despite advances in equipment, scoring has seen little to no effect from 1983 to today. The balance between par breakers, pars and bogeys has remained flat as well. The 10th plays as it was intended when Maxwell made the changes, a proper long par 4 that yields birdies with great shots. The 10th and 11th are great examples of how the tree planting has killed the strategy and excitement of the 11th at Augusta National. Had the 11th simply been lengthened like the 10th, it would have retained the strategy that made it one of the finest long par 4’s in all of golf. The effects of trees at Augusta go well beyond the 10th and 11th. Every hole where Augusta National has undertaken significant tree planting has become harder and less interesting than it was in the 80s. These holes yield less birdies and more bogeys and are out of character for the golf course and it’s original design. Meanwhile, holes where Augusta National has strictly lengthened the hole to adapt to modern distance have retained their scoring balance, strategy and excitement. In the 80's and 90's, roughly 30% of scores on the 17th would be birdies and bogeys. The distribution skewed ever so slightly in the favor of bogeys. Today, we see bogeys at the 17th over 20% of the time and birdies less than 10%. The 17th underwent substantial tree planting in the 2000s. The 17th was a strong par 4 in Augusta National’s closing stretch that allowed for two-shot swings and dramatic finishes with birdies and bogeys. Today, it's a hole that players hope to survive with par. Trees were planted on either side of the fairway and choked the expansive double fairway it shared with 15 to 45 yards. The changes to 17 and how they have impacted playing options through the years. Had Jack Nicklaus played today's version of the 17th in 1986, his tee shot would have found an expansive grove of trees, likely unable to play to hit at the green and set up one of the greatest moments in Masters history. The closing hole on the front nine has seen minimal changes in the last 50 years except for the introduction of the rough cut and a 20-yard lengthening in 2011. The recipe that should be used on every hole at Augusta. Over the past 35 years, the 9th's scoring trends have been flat. Much like the 10th, by only lengthening the hole and not narrowing with trees, the 9th plays to the original strategic intent. It rewards great play with birdies and penalizes poor shots with bogeys. The 9th and 10th play the way the holes were intended to play, fair, strategic and interesting. Despite the tree plantings, Augusta National delivers an exciting tournament year in and year out, but it’s not as interesting as it should be. If Augusta National restored the width and strategy on a number of its holes, golf fans would see more great shots, near misses and a better golf tournament. The distance gains of the modern pro have to be considered, and lengthening holes while retaining the width has proven to be an effective strategy for Augusta National. With the plans for changes to the 5th and 13th, I would urge the Augusta National membership to add the length and retain the width those holes once had. Narrowing with trees has been detrimental to the spirit of the MacKenzie-Jones-designed golf course. It prohibits players from choosing their path to the hole. It's taken away the heroic shots from players who find the wrong side of the fairway and a disadvantageous angle. Augusta National is still great, but it's not what it should be, the best.